The Street Café wants you · K-POPPED! The Street Café, one of the very few Korean halal eateries around town, is hiring. If you enjoy and appreciate Korean food and culture, this is the job for you. The owners of the café are looking for both part time and full time staff. 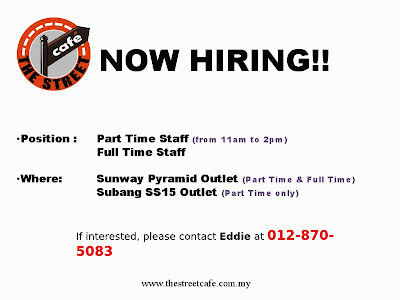 The outlets are in Sunway Pyramid Shopping Mall and Subang Jaya SS15. For more information, Eddie’s your man. Call him at the mobile number displayed above. YAY to an outlet in 1U. I go there quite a lot. I want to eat the fire-hot barbecue chicken on a stick! Spicy but very good. Ayumi, the good news is, there MAY be an outlet in 1U. No news on that yet, but will keep you guys updated. wowww!really? ?hahaa,but those plasec are quite far,ngee although im just staying in KJ jee..
part time 11am-2pm,4hrs only,kejap gileee..hahah..